Ages 4 through 6. 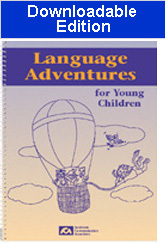 This book includes picture stories, games, and worksheet activities that can be used to strengthen vocabulary, sentence structure, and descriptive language skills in young children. In Section 1, children listen to stories approximately 75 words in length, answer questions, and tell their own versions of the stories. In Section 2, children are presented with pictures showing problem situations and asked to provide solutions for these problems. Talk and Draw. This section includes 30 short picture stories. After listening to each story, the child is asked several questions. Then the child is asked to create his/her own story about the picture. Problem Solving Stories. Each worksheet in this section includes a picture in which a problem situation is depicted. The child is asked to provide a solution for the problem and to create a story about the picture. Gameboard Fun. Students play game activities as they make up sentences describing action, answer questions, or complete sentences. Two reproducible game boards are included. Adorable illustrations are included that you may reproduce for coloring activities.